Established in 2003, the Cheetah Group Inc. is a unique branding, marketing and event management firm located in Newport Beach, CA. Utilizing its instinct for survival, combined with a cunning and predatory nature, the Cheetah Group offers a wide range of skills and services to a very unique group of clients. 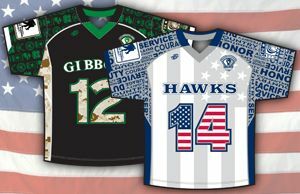 The Cheetah Group provided uniform designs to the Stick With Us Organization in Charlotte, North Carolina for its upcoming NC Champions Challenge event to benefit the Wounded Warrior Project. The Cheetah Group recently completed a design project for Synapse Sports of Annapolis, Maryland. The Cheetah Group staff returned to the mainland after working with ESPN and DAKM Enterprises to present the tenth annual Sheraton Hawai‘i Bowl at Aloha Stadium on December 24.